First we built the Room Dividing Cabinets (Plan 31-MD-00336) and decided to introduce a classic look with columns which are connected to a gently arched soffit overhead. Special features call for special techniques. How can you plan and build an arch? And what is the best way to form a column? We will show you how with this plan. 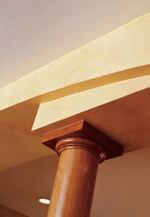 Craftsmen have developed several complicated, labor-intensive ways to make columns over the centuries. We chose an up-to-date, simple way to build the arches and install the columns, a source is supplied for buying the columns. Wood and/or Supplies needed: We used cherry, but you can use a wood to coordinate with your home.